Portion control is the key to smart snacking. Especially when you want to count calories. But how do you know how much snack to portion out? 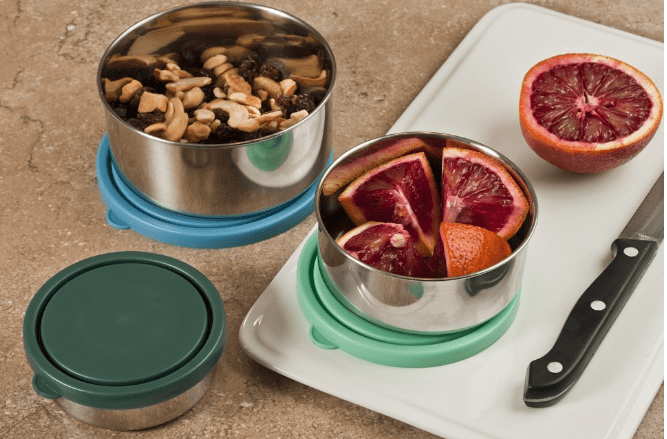 The best stainless steel snack containers help you to manage portions in a non-toxic way that’s sure to make you smile. It’s easy to bring a bag of trail mix with you to work or in the car pool lane, thinking that you’ll just have a handful when you get the urge to snack. Yet after the end of a hectic work day, or after you’ve been stuck in line for FAR too long, you’re probably shocked to see half of the bag gone. Which is why you need to plan AHEAD of time with snack size portions. Decide how much you want to eat, set it aside for the day, and you don’t have to think about it again. You can reduce the amount of calories you eat, plus simplify snacking all day long. 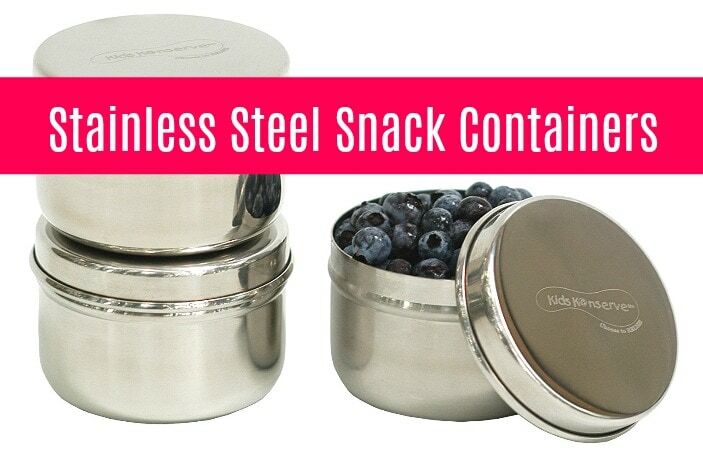 Stainless steel snack containers are important because they are made from a non-toxic material. Stainless steel isn’t known to leach out any chemicals, and it’s reusable (which saves you loads of money). What’s wrong with other options? Plastic containers can get scratched and worn with wear. Sure, they might be cheap at the beginning, but if you have to keep replacing them, the costs add up. Plastic containers with scratches or dents, and those exposed to high heat (such as a dishwasher), could potentially allow materials used in the plastic (BPA is just one of them) to come out in the food stored inside. Plastic baggies are quick and easy, but the costs add up quickly. Plus, you’re just throwing things away every day when you don’t need to. Think of how many plastic zip top bags must be piled up in landfills and floating in oceans around the world. Glass is great, but you can’t throw it in a backpack or toss it in your child’s lunchbox without worry. 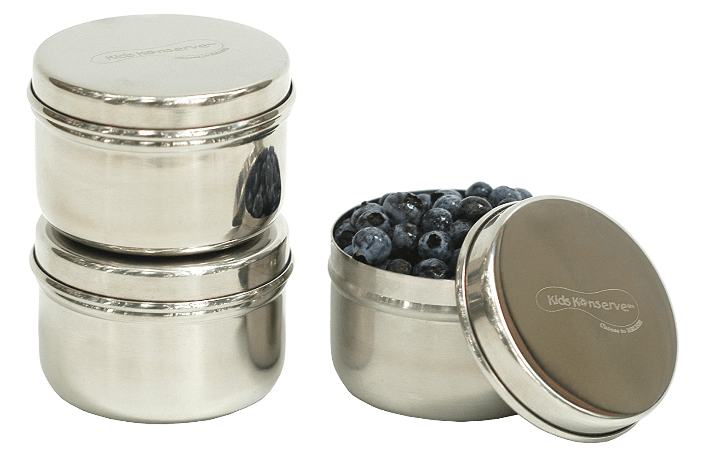 Which makes these stainless steel snack containers best bets for adults and kids alike. Toss them in a gym bag, a backpack, your purse or a desk drawer. Pack up a week’s worth of snacks in these portion control containers so you can grab one on the go and avoid temptation of junk food when you’re hungry. These colorful snack containers are 4 ounces, which holds a handful of chips, pretzels or fresh fruit. The bright green lid makes it easy to see and creates a spill proof seal. With a 1/2 cup of capacity – it’s also perfect for guacamole, salsa or hummus for dipping veggies. At just 2.5 ounces, these really small containers easily hold snack size portions of nuts, candies and more. Or use them for salad dressing, raisins, or salad toppings. Completely stainless steel, they’ll go in the dishwasher with no worries for easy clean up. 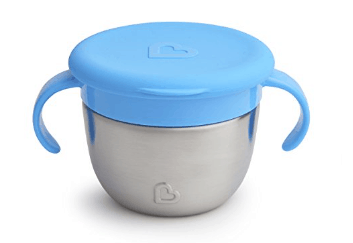 Perfect for small hands, the handles on this Munchkin stainless steel snack container are great for kids. The container comes in two colors. With soft flaps on the lid to keep food from spilling out, it’s ideal to let children feed themselves. The 9 ounce size means that a toddler’s hand can reach inside and get snack food without spilling snacks all over the place. With three different sizes ranging from 5 ounces to 12 ounces, this stainless steel set is a bargain. You can get one container perfect for lunch, and a couple more for snacks. Save room in your cabinets by nesting them together. 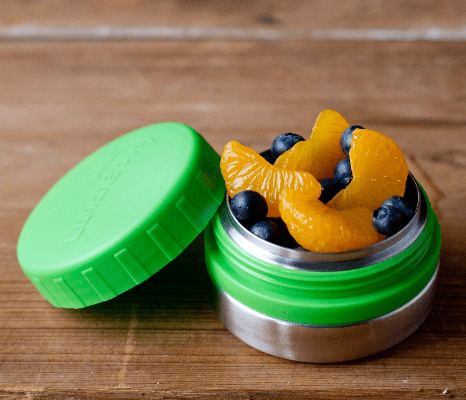 Colorful lids have no PVC, lead, phthalates or BPA. We are slowly adding more and more stainless steel to our collection. I actually found a bunch of stuff at a yard sale one time. Love it! Awesome! That’s great! What a find!